OXBOROUGH, Mass. 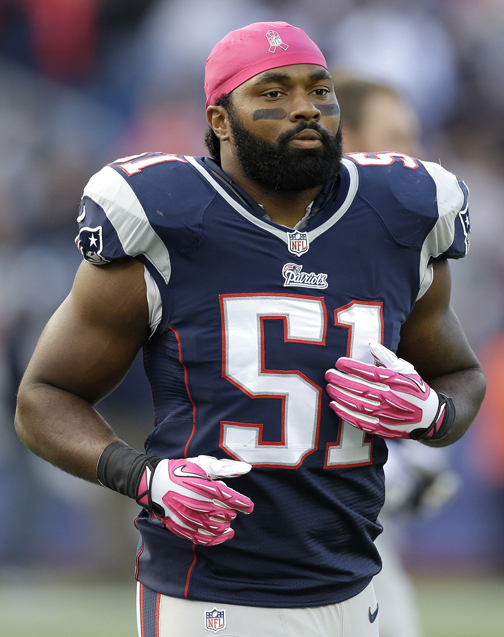 (AP) —New England linebacker Jerod Mayo will miss the rest of the season with the latest serious injury to a Patriots defensive star. The team placed the two-time Pro Bowl player on injured reserve Wednesday, three days after he was hurt in the fourth quarter of Sunday's 30-27 win over the New Orleans Saints. Mayo joins defensive tackle Vince Wilfork on IR. Wilfork tore his right Achilles tendon Sept. 29 in a 30-23 win over the Atlanta Falcons. He and Mayo are defensive co-captains. After tackling Darren Sproles on Sunday, Mayo got up and reached for the upper right area of his chest. Mayo's agent, Mitch Frankel, did not respond to a request for comment on a report that Mayo had undergone surgery for a torn chest muscle. Rookie Jamie Collins, the Patriots’ first-round draft choice, and Dane Fletcher are expected to fill in for Mayo, who has missed just five regular-season games. Mayo is the NFL’s leading tackler since 2010 with 546 and has led the Patriots in tackles in each of his five seasons. The Patriots also announced that they re-signed defensive tackle Andre Neblett and signed cornerback Travis Howard to the practice squad.